Bake one of each of these sizes-10",8",and 6" round cakes. This was made for a Mother(Grandma)'s 90th birthday. Since blue is her favorite color the cake was iced in blue icing. Place the 10" layer on a round covered cake board. Ice it with blue icing making sure it is nice and smooth. Place the 8" layer on an 8"cardboard cake circle and ice with the blue icing. Place the 6"layer on a 6" cardboard cake circle and ice with the blue icing. Let these layers set at least two hours. To assemble the cake, push a plastic straw into the10" layer at least 2" from the edge of the circle and cut the straw level with the top of the cake. Do this 3 more times so that you have 4 straws that make a square in the cake. These straws will support the next layer. Now place the 8" layer on top of the 10" layer making sure it is in the center of the cake. Follow the same procedure placing the straws in the 8" layer. Now place the 6" layer on top of the 8" layer. 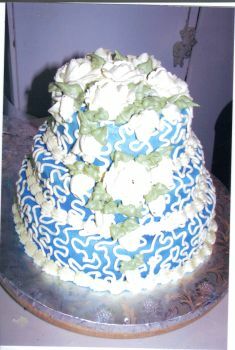 I then used ivory icing and round tip #5 and did the lace work on all the layers of the cake. Then use th3 star tip #18 and do the shell border around the base of each layer. This also hides the cardboard circles. Use the rose tip #127 and make the roses placing them on the cake top and middle layer. Make some half roses around these roses. Now make a light green icing and use tip #352 to make the leaves.